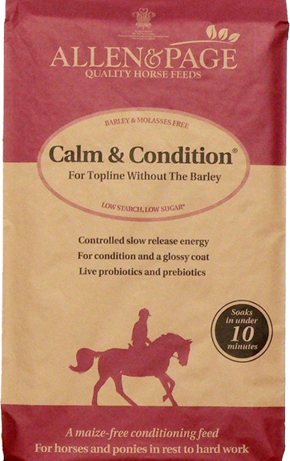 Calm & Condition is a soaked feed for horses who need to put on or maintain condition. Calm & Condition is also used successfully for competition horses who are working hard. 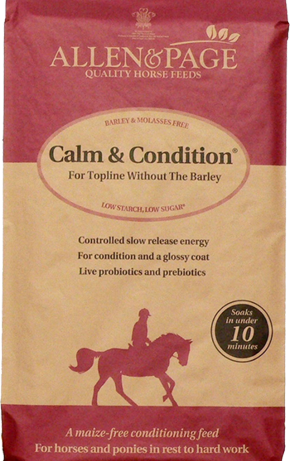 Formulated without barley, Calm & Condition is suitable for horses with a true barley intolerance. Being low in starch, high in fibre Calm & Condition also contains good levels of linseed and soya oils. Boosted vitamin and mineral levels and premium grade herbs also combine to promote optimum condition. Used by Pippa and William Funnell. DO NOT FEED DRY, THIS PRODUCT CONTAINS UNMOLASSED SUGAR BEET AND MUST BE SOAKED FOR 5-10 MINUTES BEFORE FEEDING. Introduce a new feed gradually over 7 to 10 days building up to the amounts needed to maintain condition and energy levels (0.25 – 5.0kg depending on size, type, workload and condition). Place feed in a shallow bucket, add twice as much water as feed, then stir. Wait 5 to 10 minutes before feeding this product. Dampened, unmolassed chaff or soaked Fast Fibre can be added after soaking. This feed may not be suitable for laminitics – if your horse is prone to, or has, laminitis why not try Fast Fibre? Do not feed to sheep. IMPORTANT, PLEASE READ: To get the best results from Calm & Condition, please make sure that you do not feed any other products that contain barley or molasses. Many traditional feeds contain barley & molasses which can cause excitability in some horses. Even horses that do not become fizzy as a result of these ingredients can benefit from a low starch and sugar feed such as Calm & Condition*.